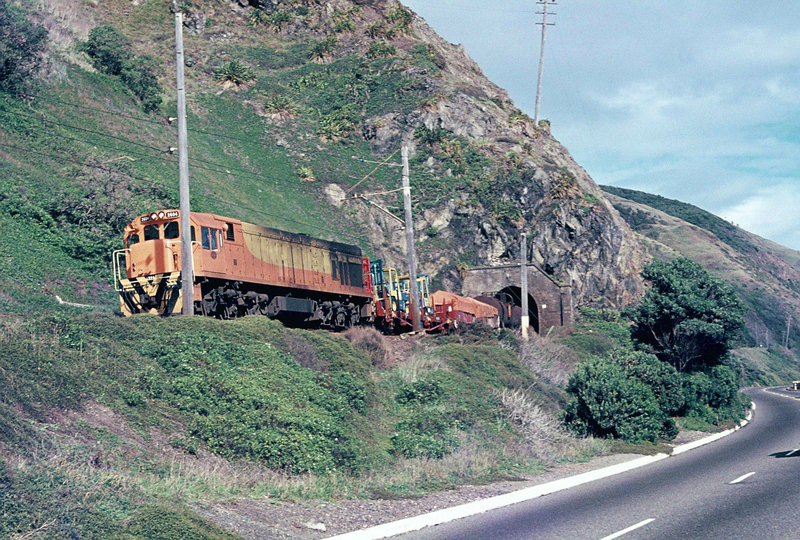 The photo by Mark Cole shows a northbound freight train emerging from this short 59-metre tunnel in 1975, close to what is now the boundary between the KCDC and the Porirua City Council. It’s the northernmost of the 5 tunnels in the Pukerua Bay section (originally there were 6 but one was later bypassed). The tunnels have presented operational problems for decades, mainly because, unlike the rest of the railway between Wellington and Waikanae, they are single track and trains in either direction often have to wait until they can enter this section. If there was double track it would certainly shave at least a couple of minutes off commuter train journey times. But double tracking the tunnels would be expensive. Another problem before 1967 was that the floors of the tunnels were too high to allow clearance for the diesel locomotives that the railways were steadily putting into service to replace steam. This necessitated all trains (except the units) being hauled by electric locomotives between Paekakariki and Wellington until 1967.